Can Kofi Annan restore Rohingya rights in Myanmar? There seems to be a very thin light of hope that the lot of Rohingya Muslims in Rakhine state of Myanmar may change for the better. Guarded optimism was expressed by some after former UN Secretary General Kofi Annan was chosen to lead a commission which is supposed to find a lasting solution to the communal conflict in Rakhine state. On August 23, 2016, a government notice announced that the Advisory Commission on Rakhine State was established between the office of State Counsellor and Foreign Minister of Myanmar, Aung San Suu Kyi, and Kofi Annan Foundation. The commission will be chaired by Kofi Annan and will include three international and six national members, and will meet all relevant stakeholders and international experts with a view “to finding the best possible solution to prevailing problems”. It will have 12 months to “submit its findings and recommendations”. This is an unprecedented move, as Myanmar has never allowed foreigners in any government commission. Annan visited Sittwe from September 5-7 to meet local leaders and see for himself the Thet Ke Pyin Squalid refugee camp, where 140,000 internally displaced Rohingyas are living in dire humanitarian conditions. During the visit, Annan met with rowdy protests from angry Buddhists, waving “No outsiders”, “No to foreigners” placards. Along with Buddhist bigots, the Arakan National Party (ANP) and the Union Solidarity and Development Party (USDP) were protesting the inclusion of three foreign members in the commission. They argue that the conflict in Rakhine is Myanmar's internal issue and no foreigner should be allowed to engage with it. The commission does not have any representation from the Rohingya community. Addressing the press in Yangon on September 8, Annan sought to dispel concerns over the potential partiality of the commission, saying that his mandate is to take on board concerns of both the state's Buddhist and Muslim communities and not to police human rights. 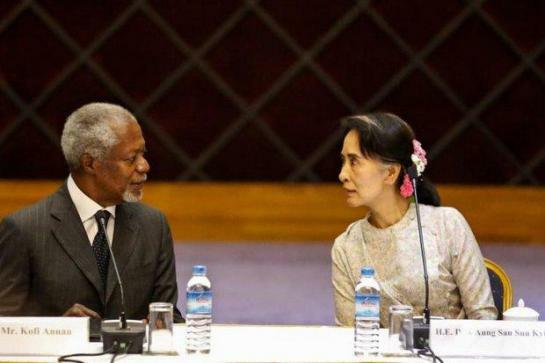 “We are here to help at the request of the government and we see this as a Myanmar Commission that we are participating in, bringing in some international dimensions and you will get an honest report from all of us”, said Annan. He also said both Burma and Bangladesh will need to collaborate to resolve the problem. Rakhine is home to more than 1.1 million stateless Rohingya Muslims, whom Buddhists call “Kalar” and “Bengalis” - derogatory terms referring them as illegal immigrants from Bangladesh. Rohingyas, denied citizenship, face violent discrimination from the majority of Myanmar that have left them in a pathetic state. In 2012, waves of deadly riots broke out between the two communities, which left more than 200 Rohingyas brutally killed. The conflict became an international issue when hundreds perished at sea as thousands tried to flee Myanmar by boats to neighbouring countries. Over 300,000 unregistered Rohingyas are sheltered in Bangladesh. The United Nations describes the Rohingyas as “the most persecuted minorities in the world”. Interestingly, the Commission began its work in Yangon in early September between two important events. First, the Panglong Conference convened by Suu Kyi, which ended on September 4, 2016; and second, Suu Kyi's visit to Washington at the invitation of President Obama. Though the Panglong Conference, which sought to make a peace deal with Myanmar's 18 ethnic groups and three insurgent armies, ended inconclusively, the Annan Commission is seen as a part of the reconciliation process initiated by Suu Kyi. In Washington, Suu Kyi was virtually treated as Head of State. She was received by President Obama at the White House on September 14, 2016. To encourage further democratic reforms, President Obama lifted the trade sanctions imposed on Myanmar in 1989 and also restored GSP facilities for Myanmar exports to the US. Since assuming the onerous role of chief of the NLD-led government, Suu Kyi has been trying to push for democratic reforms and consolidate her position as State Counsellor – euphemism for Prime Minister. Suu Kyi is keen to show to the generals the economic benefits of a democratic transition. She is also eager to show that democracy can unify the nation by bringing in different armed ethnic minorities, including the Rohingyas, through reconciliation. Indeed, Suu Kyi needs the support of the West, particularly Washington, in her efforts. Suu Kyi was widely criticised for not condemning the riots of 2012. Her silence had actually encouraged the “Ma Ba Tha”(Protection of Race and Religion) movement led by xenophobic Buddhist monk Ashin Wirathu to instigate communal riots. She formed the Commission with international personalities not only to silence her critics but also to raise her administration's authority and credibility. Addressing the 71st UN General Assembly in New York, Suu Kyi referred to the Rohingya issue saying, “By standing firm against the forces of prejudice and intolerance, we are reaffirming our faith in fundamental human rights, in the dignity and worth of the human person”. Prime Minister Sheikh Hasina met Suu Kyi on September 19 on the sidelines of the UNGA, and welcomed the Kofi Annan Commission. If Kofi Annan needs help, surely Bangladesh will come forward. Assuming that the Commission makes recommendations for the restoration of rights of the Rohingyas, it will be difficult for NLD not to implement them. On the other hand, given the widespread racial intolerance, it will test Suu Kyi's efforts towards restoring the rights of the Rohingyas, including citizenship. More importantly, whether the military generals will accept the Commission's proposals remains to be seen. However, hopes have been raised when Suu Kyi said that there was “persistent opposition from some quarters” to the establishment of the Commission, but her government would persevere in its efforts to achieve peace in Rakhine. Let us hope that Aung San Suu Kyi will firmly handle Buddhist fanaticism and redress the plight of Rohingyas in Rakhine. The writer is former Ambassador and Secretary.